Caxton acquires stake in Novus Holdings. 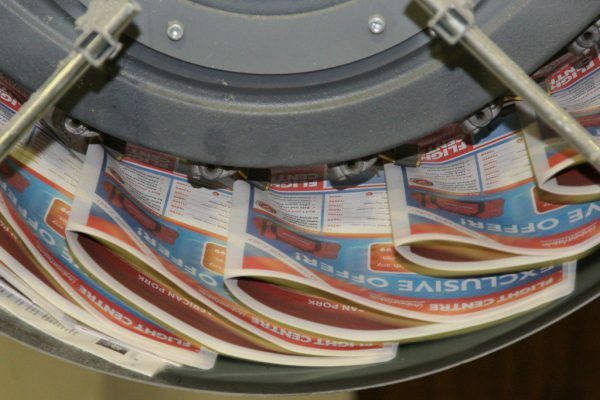 JSE-listed printing and publishing group Caxton is hoping to benefit from new print work for Media24 that would mitigate current tough market conditions. Media24 is the biggest publisher in the country and prints a large number of newspapers and magazines on a daily, weekly and monthly basis. It has been tied to a printing contract with former subsidiary Novus Holdings, but has given Novus notice that it will terminate the contracts. 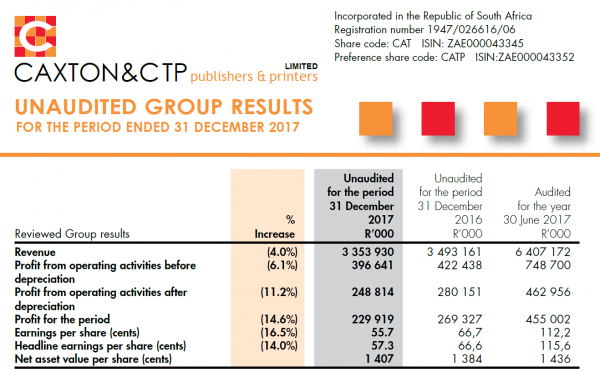 Caxton states in its interim results for the six months ended December 31 that negotiations with Media24 are at an advanced stage and it hopes to benefit from new printing contracts with the group from April this year. Caxton reported a 4% drop in revenue to R3.3 billion, compared to the first half of the previous financial year. Net profit was 14.4% down at R229 million. Earnings per share of 55.7 cents was recorded, which is a 16.5% decline from the first half of the previous financial year. Headline earnings per share was 14% down at 57.3 cents. The group says trading conditions in all its markets were difficult with subdued volumes and pricing pressure that resulted in a decline in revenue. Local and national advertising volumes were lower, which led to a decline in volumes at the group’s commercial printing operations. The depressed economy affected consumer demand for packaging. Caxton tried to mitigate the depressed market by controlling costs. During the reporting period the group acquired a stake of almost 5% in Novus Holdings. It also bought Private Property Proprietary Limited – a leading property portal – and a small label manufacturer in the Western Cape. It disposed of Moneyweb Holdings and Ramsay Media at a loss of R6.6 million. The group says it has a strong balance sheet and is well positioned for the right acquisitions. Earlier this month, Caxton settled a long-running dispute with the Competition Commission regarding an industry practice of paying commissions on advertising volumes. The group says while it could have contested the matter, it preferred to settle and agreed to pay an administrative penalty of R5.8 million as well as make an annual contribution of R700 000 to a bursary fund. Caxton’s share price closed 6.17% down on Thursday at R11.25. The share has lost 9.51% of its value over the past 90 days and 16.6% over the past year.